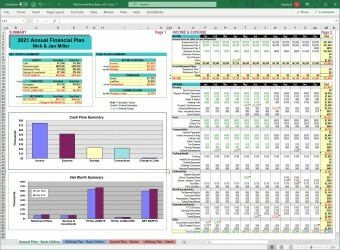 The MyFinancePlans Full Edition personal finance spreadsheet template provides the most features and room to expand. It is suitable for those that want the most capability, flexibility and accuracy for their personal finances. The Full Edition includes a 10 page Annual Plan, a 13 page Lifelong Plan, and the User Guide. To compare edition features click on the Compare Plan Features tab above. 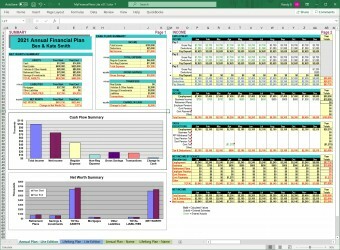 The MyFinancePlans Full Edition personal finance spreadsheet template is full featured and is suitable for those that want the most capability, flexibility and accuracy for their personal finances. It has more features and fields than the Lite edition, including more types of retirement and investment income, more savings and investment types, better handling of taxes. All editions of MyFinancePlans includes an Annual Plan and a Lifelong Plan set which are linked. And there are two plan sets, one which is a a fully completed realistic example for your reference and one which is blank for your use. The plans are in english language and the currency is in dollars, but either can easily be changed as required. 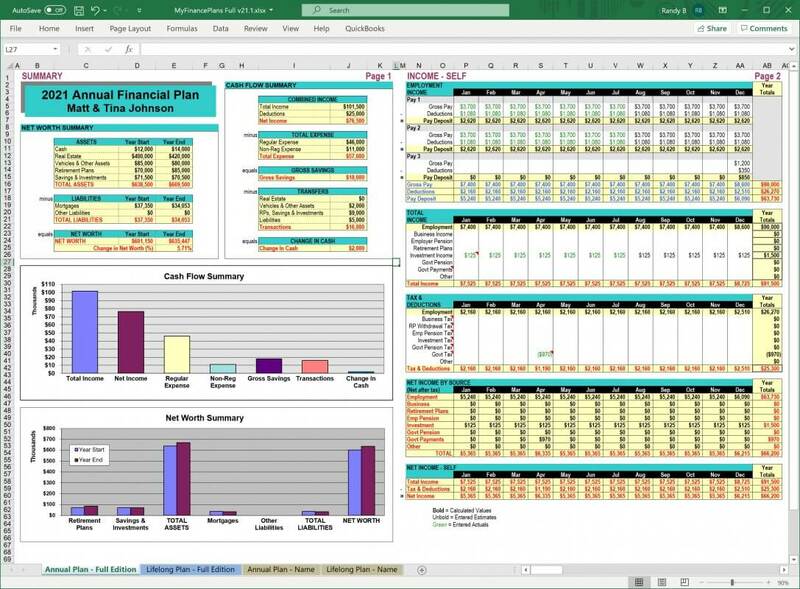 The Annual Plan is an easy to use spreadsheet template that gives you a clear view of your annual income, expense, investments and cash flow, as well as your change in assets, liabilities and net worth. Summary graphs enable you to see at a glance your cash flow and net worth for the year. 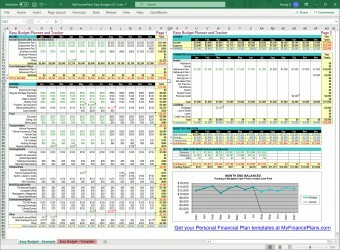 The Lifelong Plan is an easy to use spreadsheet template that gives you a line per year view of your income, expense, savings, investments, cash flow, assets, liabilities and net worth. Net worth and cash flow summary graphs enable you to see your financial goals taking shape over time and to easily compare the long term impact of different financial decisions. In the Full Edition the Annual Plan is 10 pages long and the Lifelong Plan is 13 pages long with more features than either the Lite edition or Basic edition. For a detailed comparison of the features of the Basic, Lite and Full editions of MyFinancePlans click on the Compare Plan Features tab above. MyFinancePlans User Guide - a PDF document file (.pdf) which covers all editions of MyFinancePlans. How to get the files? Obtain your copy of the Full Edition by clicking on the Add To Cart button and checking out. Payment will be made through PayPal to ensure security. You may use a credit card or other payment method. A PayPal account is not required if you don't have/want one. Immediately following your order an email message will be sent to you with a download link in it. Open this email message and click on the link to download the zip file to your computer. Then find the zip file on your computer and unzip it using Windows or any Zip program to access the files within. Open the spreadsheet file with Microsoft Excel 2003 or newer, or any compatible spreadsheet program. Open the User Guide with Adobe Reader or any PDF viewer program. Click below to download the free MyFinancePlans User Guide. The guide covers all editions of the MyFinancePlans personal financial plans and personal budget templates.